Tsipras has been hailed as a statesman for his decision to reach a settlement with the Former Yugoslav Republic of Macedonia (FYROM). It did indeed take political courage to settle a dispute that has dragged on for more than a quarter of a century, breeding animosity and becoming more difficult to resolve as time went on. However, for someone to be regarded as a statesman, he or she must try to rise above party politics and narrow interests to create consensus and unite as many people as possible behind a cause. Tsipras did not do this. Although opposition claims that he negotiated in secret are wide of the mark (the prime minister met with opposition leaders and his foreign minister briefed party officials in detail about the negotiations) Tsipras made no effort to create a common position before launching talks with his FYROM counterpart Zoran Zaev. Instead, the SYRIZA leader sensed an opportunity to cause a split within the ranks of his main rival, New Democracy, obsessing more about the conservatives’ position on the prospect of a solution than Zaev’s. Equally, his government’s reaction to the public protests against the name deal showed a desire to strengthen a “them and us” narrative rather than to show genuine leadership by letting people know their voices had been heard. While there are far-right extremists among those who are opposed to an agreement, not all those who have concerns about the deal deserve to be indiscriminately dismissed as rabid nationalists. Tsipras failed to show the necessary sensitivity to those who took a different view of the matter, ignoring in the process the deep-rooted concerns (even if in some cases they are based on myths or misunderstanding) that exist within Greek society. This was not the behaviour of a true statesman. Nevertheless, Tsipras deserves credit for capitalising on the fact that after years of facing governments in Skopje which were more interested in turning the city into a kitsch Ancient Macedonian theme park than engaging in constructive dialogue, Zaev showed a willingness to be reasonable. No doubt, the geopolitical circumstances and pressure from the European Union and the USA also helped bring the two sides closer together. The settlement reached, and which was signed on Sunday, may not be perfect, but agreements of this nature rarely are. In both countries, critics of the two prime ministers have accused them of betrayal, which suggests that a decent balance was struck in the text. The accusation against Tsipras of “high treason,” including from within New Democracy’s ranks, are a shameless attempt to whip up public anger and to mask the fact that the agreement is in line with the demands the Greek side (also when the conservatives were in power) has made for many years. During the debate ahead of the no-confidence vote called by New Democracy because of the party’s assertion that Tsipras lacked the “democratic legitimacy” to sign the deal, Foreign Minister Nikos Kotzias produced a number of declassified documents that shed light on Greece’s negotiating position since the dispute arose in the early 1990s. While questions can be asked about how Kotzias managed to get these papers declassified and how selective he was in his choice of which to share, the documents indicate that under previous administrations Greece was willing to accept FYROM changing its constitutional name from Republic of Macedonia to Republic of North Macedonia. They also suggest that the issues of nationality and language have not always been of paramount importance for Greek negotiators. New Democracy leader Kyriakos Mitsotakis argued on Saturday that by allowing citizens of Greece’s northern neighbour to be called Macedonian and the language they speak to have the same name, the “North” in from of the country’s name becomes redundant and of no value. Regardless of whether this is incompatible with the position taken by New Democracy in the past, it also ignores the fact that Greece is not in a position to determine what its neighbour calls its people and language. The only way that this can change is if Skopje agrees to such a concession. It was made very clear, though, by UN mediator Mathew Nimetz from the start of these negotiations (as in the past) that language and nationality were not up for discussion. The concessions Greece gained are in other areas: FYROM will have to change its name (if approved in a referendum) so that it has a geographical qualifier to differentiate it from the Greek region of Macedonia, the new name will be used domestically and internationally (erga omnes), it will also have to alter its constitution (if approved by Parliament) to remove references that could be construed as irredentist and Greece’s neighbour will have to refrain from any moves aimed at cultural or historical appropriation of Ancient Greece, include Alexander the Great and the Macedonian kingdom. These elements have been key goals for Greek diplomacy since the 1990s and rarely was there a time when Athens felt that they could all be achieved. Of course, there are other elements of the agreement that might be deemed less favourable (joint-committees to debate the content of history books, for instance) but on the key points, the government has achieved most of the concessions Greece wanted. It is, therefore, a pitiful sight for New Democracy and PASOK, which have both been involved in negotiations that moved along this track, to portray Tsipras and his government as traitors or sell-outs. Conservative leader Kyriakos Mitsotakis even went as far as suggesting that “maybe” Tsipras had agreed to the settlement with Zaev because he was promised a more generous debt relief deal by Greece’s European lenders. Anyone who has knowledge of discussions between the country’s creditors will know that this is groundless conspiracy talk. After all, the package of debt interventions under consideration was publicly set out after a Eurogroup meeting in June 2017. Apart from the fact that this intentionally inflammatory language boosts the extremists who want to capitalise on public concern and opposition to the deal, it also represents hypocrisy of the highest order. The two opposition parties, New Democracy in particular, are assailing in the tawdriest way a deal that they would have been perfectly content (according to all indications) to sign if they had been in power. The same goes for several journalists, commentators and academics. Having been consistently in favour of a solution along the lines of the one currently on the table, they have suddenly changed their mind. Some claim that the important issues are not the neighbouring country’s name or whether it will make changes to its constitution, but other aspects of the agreement – ones which have barely featured in the public debate over the last decade, when Greece softened its position on the matter. Others argue that the process by which the agreement is being ratified is not acceptable because Tsipras failed to show he has a parliamentary majority to support it. Yet in the build-up to the agreement there was a furore over the possibility of Greek Parliament voting on the pact before it had been approved in FYROM. 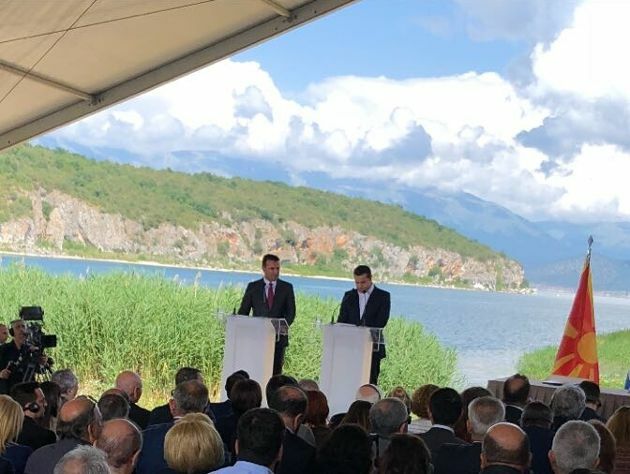 Tsipras was told in no uncertain terms by the opposition that any deal should be ratified north of the border first to ensure Zaev’s government did not wriggle out of its responsibilities. Furthermore, centrist To Potami has indicated that it will support the agreement, meaning that there would be the slimmest of parliamentary majorities in favour of the deal. The fact SYRIZA’s junior coalition partner, Independent Greeks, (ANEL) is not in favour of the pact does create a political problem but the nationalist party refused the opportunity to bring down the government on Saturday. Another excuse used by those arguing that the agreement should be rejected is that there is a lack of public support. A Marc poll for Proto Thema newspaper suggested that 68.3 percent of voters are against the agreement. But since when has opinion poll data been the determining factor when making a decision that will shape the country’s future of decades to come? Many of the same observers argued in July 2015 that Tsipras should ignore the 61.3 percent of Greeks who voted against a new bailout in a referendum because it was not in the country’s interests to do so. When the SYRIZA leader by-passed the result and agreed a third programme with Greece’s creditors, they argued that it was the first responsible thing he had ever done. All of this suggests that much of the criticism of the deal is not motivated by genuine objections about its content but by the identity of the person who has signed it. If so, this says more about the prejudices and insincerity of those complaining or stoking discontent, than it does about any shortcomings in the agreement. As justified as their dislike of Tsipras and his politics may be, it does not legitimise their own intellectual or political inconsistencies. It is possible to accept that given the history of the name dispute, Greece has reached a reasonable agreement without that meaning Tsipras and his government are absolved of their failures or deserve limitless praise. It is equally feasible to highlight areas of the deal that are weak without portraying as some kind of national capitulation. This display of opportunism from his political opponents and critics elsewhere means that (if the deal is ratified), Tsipras sole legacy will not be just the settlement of the longstanding name dispute. He’ll have also made performing a flawless kolotoumba (somersault) the official national sport. Thanks for your detailed article. Just a quick notice: You mention that Matthew Nimetz had turned down the possibility of any talks about nationality and language names. However, the linked article you provided presents the complete opposite. Namely, that Nimetz had included the issues of nationality and language in the discussion, and Zaev instead was the one who claimed that identity would not be a topic. Is there any other posterior source confirming your claim? I will try to make this short as its a Eurogroup day and that's where we need to focus now. I simply start from the core assumption that this deal was completely optional for Greece in 2018 (many of us Balkan vets saw it coming last summer) with so much happening on other key issues (Aegean. Cyprus, refugees) and Greece losing ground on some fronts. Certainly rushing for the EU/NATO summer summit deadlines was completely optional and for Greece this set up a negative dynamic. I think time will demonstrate that accepting the "Macedonian" nationality effectively undercuts the "erga omnes" gains FM Kotzias achieved. I know my former bosses in the State Department would never sign off on something that I negotiated (boring UN resolutions mostly) that included give-aways that minimized/undercut the headline achievement (erga omnes in this case). I believe it was completely reasonable for Greece to insist, for as long as neccessary, on some hybrid nationailty reference, be it Slavo-Macedonian (not my favorite as it insults the Albanians) or North-Macedonian. It's a fair price to ask, after all Macedonia/FYROM/North Macedonia is a construct and progressive intellectualls there recognize this. Greece just needed to adjust the foundations to fit the neighborhood and Athens had the tools to achieve this. Again, your insight is appreciated. From your knowledge, was there ever a time during the 25 years or so that this issue has been under negotiation that a potential deal involving a composite name with a geographical qualifier for erga omnes use, a revision of the constitution as well as changes to nationality and language was on the table? I have been one of the first to note that achievement of the erga omnes objective which Greece has had in place for years now is Athens' major strategic victory. As a former diplomat however, (and deeply anti-Syriza but mostly for economic policy reasons) I think this post brushed over the major concessions Tsipras delivered -- from a position of unassailable strength -- on nationality and language in order to close the deal on a timeline SET BY OTHERS. Time will show whether those concessions actually serve to undercut the gains made regarding erga omnes useage; I think they will. It would have been perfectly reasonable to let the summer EU and NATO summits pass, let time increase the pressure on Zaev, and work from a position of strength (some called this "Plan B") until the nationality issue was handled correctly. And if things failed to prooceed, so be it. Thanks for your comment, Alec. It would be interesting to hear what you think the concessions on language and identity could have been, while also making the agreement viable. After all, a deal is only worth making if both sides can uphold it.